This is also the one anniversary of the passing of Mark Dille, who passed away last May 5th from a long battle with cancer. This event is special to me, because along with Mark we were instrumental in the animal rescue movement which barely existed in San Felipe when we arrived here in 2003. Come join us for the first ever breakfast/casino event to help raise money for ZAPP. Enjoy a great breakfast, and early morning cocktails provided by the Pavilion, which begins at 8am, with the gambling portion of the event beginning at 10am. Food and beverages not included. 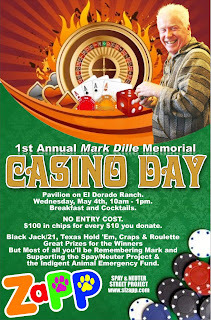 Blackjack, Texas Hold 'em, Craps & Roulette will all be played for some great prizes and gift certificates. 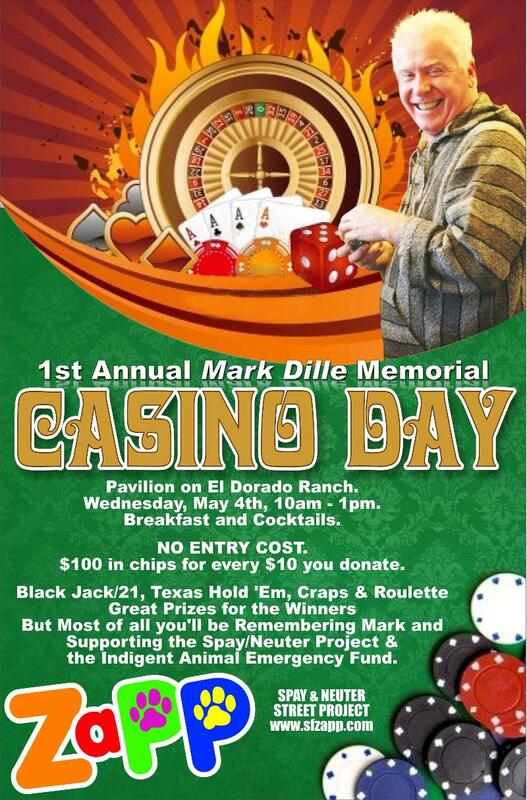 Help me remember my buddy Mark, and help support our cause. There is NO entry fee, and a $10 donation will get you $100 in chips to gamble with. See you there. May 4th at the Pavilion, 10-1pm. ZAPP Spay/Neuter Street Project and the Indigent Animal Emergency Fund will hold a much needed benefit and fund raising event for our project.